Broadband Internet access is a contentious issue in South Africa. While prices have been coming down, ADSL, 3G, EDGE and HSDPA are still pretty expensive, and currently out of budget for most of those who would love to acquire broadband. 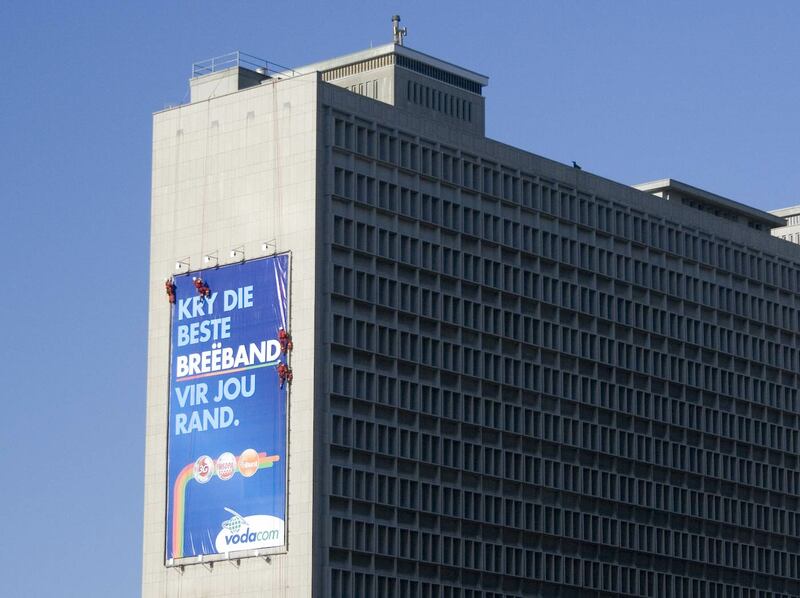 The poster that's being attached to the building by the Men in Red is an Afrikaans ad for one of our mobile phone networks, and translated it reads "get the best broadband for your Rand". It must be fun doing this kind of work, being out in the fresh air above such a beautiful city, abseiling, protecting the world from alien invasion [if you look carefully you'll see that Will Smith is the bloke at the left top corner ;)]. Posted in General on Saturday, 26 May, 2007 by Paul.